UCJV300 helps us handle increasing window-related jobs effectively. Multi-layer print enhances our powers of expression and proposals in window decorations. We can be reassured even in jobs requiring same day delivery. "We appreciate UCJV300-160 for its promptness in completing jobs." 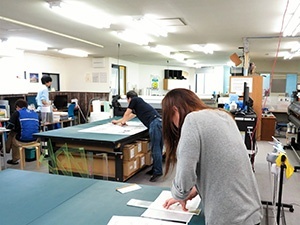 says Ms. Tomoko Moriya, manager of G-Craft, evaluating this inkjet printer (IJP). One of the characteristics of G-Craft is that they print a lot of window sheets to decorate store windows in department stores and shopping malls. Store windows decorate entrance of department stores and add color to store fronts in a shopping mall. It is a field called visual merchandising (VMD). Decorations of stores not only affect their sales, but serve as the store's face to express its message and trends of the town. As printed materials for window decorations are attached to a glass, they are often printed on transparent materials, and there is a great demand for white prints on glass surface. What can satisfy such demands was "UCJV300-160". Shift from outsourcing to in-house production brought "flexibility" and "reassurance". Having had no IJP capable of printing with white ink, the company previously outsourced some print jobs, especially when printing with white color on transparent materials. 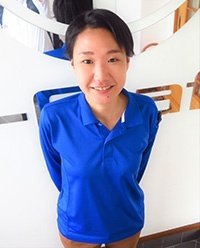 Ms. Moriya, the manager says, "In busy periods like Christmas, all the staff who usually work in-house for print jobs also go out for applying. Needless to say, I am one of those who go out to work on applying." Decoration works on store windows are performed late at night after the stores are closed, and they must be completed by the time the stores are opened next morning. In such a job, if the printed material turns out to have a problem, the outsourced company is closed, and they are placed in an unrepairable situation. Off course they conduct multiple checks to prevent such situations, but "It's true that we had to take on huge emotional strain. ", says Ms. Moriya. When they order a job, they often have a difficulty in telling how they want the work done to the outsourced company. Inability to handle such delicate control was also a big stress to Ms. Moriya. Especially in busy periods, many jobs have tight delivery deadlines. It is nothing unusual that the design comes up in the morning of the day on which they have to apply it. They sometimes had to explain the request of delicate expression for the design to the outsourced company and go to the installation site, believing that the print is carried out correctly as requested. "We have a feeling of overwhelming tension at the site of work in a department store in the middle of the night. If we drop through, it is just helpless. Fortunately, we have had no big mistakes so far, and somehow managed to prevent situations that cause a trouble to customers. After introducing "UCJV300-160", however, we feel reassured that we can print it again in-house if necessary." As to machines manufactured by Mimaki Engineering, G-Craft has "JV300-130", "JV400-130LX", and "UJF-3042MkII", as well as two "JV33-130" installed. Mr. Takashi Kitazawa, the company's President, asked; "We are going to introduce a new IJP. What do you think is a good choice?" So, they viewed samples of IJP from different manufacturers and their demonstrations, and had a great deal of consideration together. They selected "UCJV300-160" this time because the existing "JV33-130" has been versatile and had few problems, which built a feeling of trust in Mimaki products. As "UCJV300-160" has improved in productivity and reached the level equivalent to solvent IJP, they judged that it can be a candidate for a production machine. Processing site of the company. After printed, materials are processed and shipped one after another. The company is receiving increasing number of window-related jobs which was originally a small business. Such business circumstances also gave a boost to the introduction. Printing on transparent media used for window display was possible with the existing solvent printer as well, however, the colors did not come out clean because it cannot use white ink. They also had a problem that it was not capable of double-sided print, which was another increasing demand. Ms. Moriya was attracted to the quick-drying property of UV. Most of their jobs need to be delivered in a week or so, but some urgent jobs require same day shipping. In their production system, print orders are processed in order of data arrival in sequence, from production, post process, packing, delivery to applying. Orders are usually shipped one after another. But in busy period at the end of year, stocks often overflow in the office since items printed with a solvent IJP require drying time of about 24 hours and therefore force some wait time. In that regard, when using UV, the ink is cured upon printing, which allows them to proceed to the post process immediately, and thereby shortens the time to shipment. This is why Ms. Moriya mentioned at the beginning "We appreciate "UCJV300-160" for its promptness in completing jobs." As to materials used for print with "UCJV300-160", transparent media accounts for 70 %, followed by FF sheet and tarpaulin. In most cases, printed materials can be applied as they are, basically without laminating. "However, as high quality is often expected in our jobs, we handle them very carefully not to have them scratched." says Ms. Moriya. As to the quality, the film thickness unique to UV curable ink is perceived as a character of UV, and it does not bother them nor their customers. It makes difference of only textures. They recognize that "UV makes matte texture," and explain that to customers. The matte appearance even brings a positive effect in some cases. Of course, they have processed orders after having samples checked by customers and gaining their consent. The introduction brought various changes including; "Ability to print on black mounting" and "Support for media sized 1,620 mm in width, compared to 1,200 mm or less they used to use for most orders received." Such changes widened the range of orders they can receive. 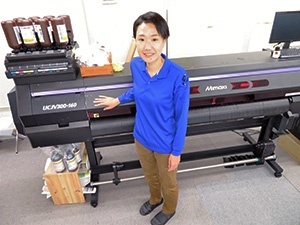 Ms. Moriya, manager, and "UCJV300-160"
G-Craft has advantages in package orders that encompass all the processes from printing to installation, converting customers' images accurately into products. What are most encouraging to the staff are customers' comments such as "The previous display was quite good. ", "It brought in many customers. ", and "It was covered by some media." 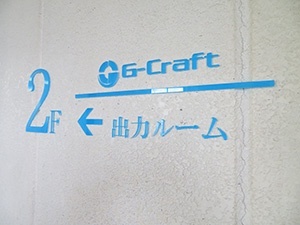 The company receives difficult orders that "can only be fulfilled by G-Craft" and "definitely need to be finished beautifully." It is such a difficult request that excites Ms. Moriya and her staff. "UCJV300-160" was introduced as a reliable ally to meet such requests. Among existing printers, Ms. Moriya's favorite one is "JV33-130", a solvent IJP. "I shared good and bad times with it, and took on challenges for various products, which makes it precious to me. When I have a job to assign, I tend to put it to JV33. But "UCJV300-160" is gradually becoming another reliable presence," she smiles. UCJV300-160 now emerging as the main machine, will surely play a leading role in the coming busy period. G-Craft is a company engaged in production and installation of events, signs, displays, and promotion tools. Founded in 2014, the company is located in a downtown residential area near Mizumoto Park, Katsushika-ku. It has a substantial customer base, mainly of show exhibitors, showrooms, and department stores. It gains high acclaim as an agile and adaptable player providing comprehensive service from print to applying as its selling point.